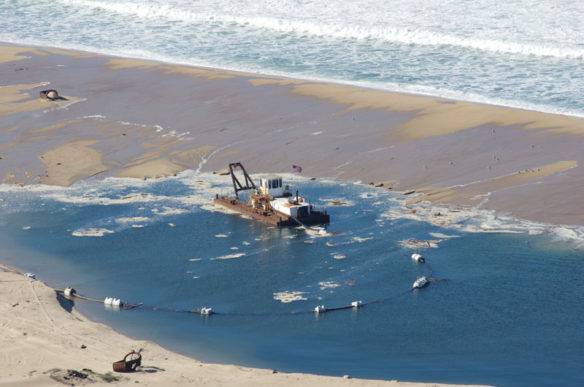 Six years ago, nonprofit environmental advocacy organization San Francisco Baykeeper sued sand-mining firm Hanson Marine Operations and the State Lands Commission to stop sand mining in the Bay. However, in November, an appeals court judge sided with the State Lands Commission and the sand mining company. The State Lands Commission owns the sand in the public trust and approves or rejects requests to sand-mine.Hoping to persuade the Commission and courts to stop the mining, the Baykeeper cited studies by its own researchers and others that show that sand at the bottom of the Bay drifts to nearby Ocean Beach. The justices ruled the sand mining increase is allowed. It’s a setback for the San Francisco Baykeeper. A California appeals court has ruled that sand in the San Francisco Bay must be considered a public trust resource, potentially challenging the practice of mining for sand in the Bay that’s in turn used in construction projects. Wednesday’s ruling in the lawsuit between San Francisco Baykeeper and the California State Lands Commission in the California 1st District Court of Appeal is considered a major victory by environmental advocates who have argued sand mining contributes to erosion at Ocean Beach and threatens the Bay’s ecosystem. The Lapis Sand Plant, in operation since 1906, is the nation’s last coastal sand mine. The California Coastal Commission has threatened to close the plant, but the company refuses to relinquish its claim to the uniquely coarse amber-colored Monterey sand, which it calls “Lapis Lustre.” But Cemex is the world’s second largest building materials company, and any attempt to kick it out is likely to immerse the state in years of expensive litigation. Despite the colossal quantities of sand and gravel being used, our increasing dependence on them and the significant impact that their extraction has on the environment, this issue has been mostly ignored by policy makers and remains largely unknown by the general public. “Sand Wars” film documentary by Denis Delestrac – first broadcasted on the european Arte Channel, May 28th, 2013 in its french version: “Le Sable: enquête sur une disparition”, where it became the highest rated documentary for 2013 – expressly inspired the United Nations Environment Programme (UNEP) to publish this 2014-Global Environmental Alert. Learn simple things that you can do to help protect beaches starting with simply educating others about the beach thereby helping us celebrate the beauty of the world’s beaches. Sign the petition to end global sand mining. Beach communities that rely on dredging to replenish protective dunes object to expanded federal protections. Environmental advocates are pushing back with warnings about the possible ecological damage from beach replenishment projects that they call sand mining. After water, concrete is the most widely used substance on the planet. But its benefits mask enormous dangers to the planet, to human health – and to culture itself. Private beach sand miners can no longer mine the coasts of India, as per a Gazette notification by the Union Ministry of Mines which has just been made public. Sand from glacial melt could be Greenland’s economic salvation? As climate change melts Greenland’s glaciers and deposits more river sediment on its shores, an international group of researchers has identified one unforeseen economic opportunity for the Arctic nation: exporting excess sand and gravel abroad, where raw materials for infrastructure are in high demand. Irresponsible sand mining in the Ayeyarwady River is destroying the livelihoods of farmers and fishers and placing environmental stress on the nation’s rice bowl. Sand mining is the world’s largest mining endeavor, responsible for 85 percent of all mineral extraction. It is also the least regulated, and quite possibly the most corrupt and environmentally destructive. After pictures emerged on social media earlier this month of a giant sand dune being bulldozed, there’s been an angry reaction among eco activists and the general public.